According to a market research study by Fact.MR, a research firm in Dublin, Ireland, the broader trends affecting the packaging industry also are influencing the dynamics in the blow molded containers market. Global demand for blow molded containers is likely to reach nearly 33,000 kilotons by the end of 2018, equaling a market value of more than $185 billion. A wide range of discrete aspects, ranging from a shift toward sustainability to rising demand for puncture-resistant packaging solutions, is likely to underpin the growth of blow molded containers market during the assessment period. Demand for blow molded containers continues to be influenced by their resistance to abrasion and high recyclability. Growing popularity of single-serve beverages and convenience foods also is likely to create sustained opportunities for blow molded containers market players during the assessment period. The study suggests that market players who offer customized and proprietary containers in a wide-range of shapes are likely to achieve long-term customer retention. Blow molded PET containers continue to be the top-selling product type in the market. The high demand for PET bottles can be attributed to cost savings and growing focus on sustainable packaging. Demand also is likely to be healthy for HDPE containers owing to high rigidity and excellent barrier properties. According to Fact.MR, blow molded containers will continue to see steady demand in the manufacture of bottles and cans. The rising popularity of single-serve beverages and liquid supplements is contributing significantly to the overall demand. The jugs and jars segment is further likely to trail the former in terms of adoption rate and is highly likely to introduce lucrative avenues for the stakeholders of the blow molded containers market. Tier 2 players in the blow molded containers market are focusing on introducing products with advanced features and providing economical alternatives to consolidate their market stronghold. Furthermore, the tier 3 players in the blow molded containers market are focusing on gaining much-needed recognition in the marketplace and are investing on devising robust marketing strategies to achieve the same. The study also touches on key differential strategies adopted by the market players of blow molded containers in a bid to gain competitive advantages. Emphasis on vertical integration and use of bio-plastics are outlined as some of the key strategies adopted by the stakeholders of the blow molded containers market. The report says the advent of advanced technologies, such as 3D printing, are likely to diversify growth trajectory of the industry. While diverse regulations and legislations will continue to govern the market space, blow molded containers with quality assurances, such as Food Safety HACCP-9000, will gain substantial prominence. 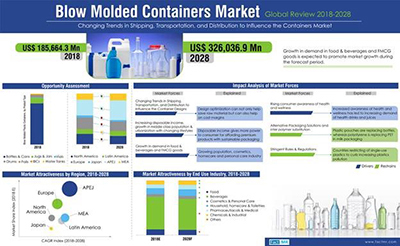 The report also states that the blow molded containers market might be subjected to intense competition from alternative packaging solutions, such as liquid cartons and plastic pouches, which might confine the adoption rate of blow molded products around the world. 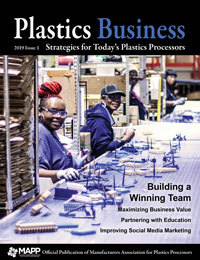 These insights are from a research study on the Blow Molded Containers Market by Fact.MR. For more information, visit www.factmr.com.